“This morning’s ritual is a statement. It’s intended to remind us that Pacific Union College has deep roots, and we’re part of a tradition that began long before 1882 and that first day of classes in Healdsburg,” said Anderson. He presented the college’s gift to Cushman, stressing it must be “the right sort of gift” for the intended recipient, and also as a reminder of who we are as a college. The unique gift, crafted by Dr. Lorne Glaim, professor emeritus of history, was a mounted rock from the farm of Adventist pioneer William Miller, in recognition of the Lord’s promise to create a new heaven and a new earth, as well as Cushman’s love of geology. “Consider this rock and the hope it represents. If you do so, we can say, using language that every Adventist understands: your work will never be called a ‘Great Disappointment,’” teased Anderson. In the inaugural homily, titled "Mt. Blessing," Carter stressed the challenges facing higher education, and small colleges in particular. However, he urged the college administrators and Cushman to persevere, saying he believes PUC is uniquely prepared to meet these challenges, as a prestigious institution in a unique and incredible location, a “beacon on Howell Mountain.” Carter believes as a geologist and fellow scientist Cushman is well-equipped to lead PUC into a bright future, with an analytical mind grounded in biblical context. Carter also shared examples from when he served as campus chaplain at Walla Walla University during Cushman’s time as a student, saying he felt they portrayed Cushman’s good nature and kindness. 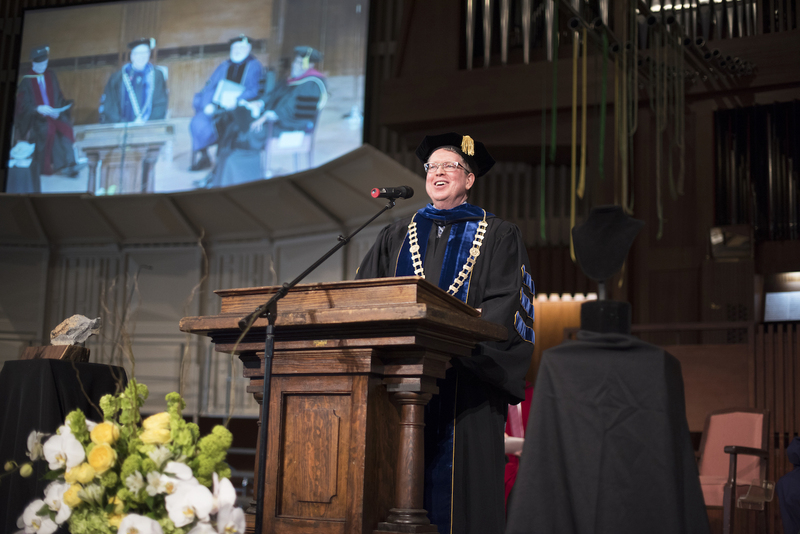 The campus and the surrounding community shared in the excitement and celebration of the event, and offered their praise and commendations to Cushman on his leadership thus far, and their hopes for his success in the future. “Dr. Cushman’s vision of inclusivity for Pacific Union College upholds its long-standing tradition of academic excellence and service to the community. I look forward to our continued partnership and welcome Dr. Cushman to the Napa County community,” said Diane Dillon, Napa County supervisor. “This school year, I have first-handedly experienced Dr. Cushman’s active participation in student-led programs and activities. He has quickly become appreciated for his availability and leadership style that prioritizes listening. With a shared love of our campus’ surroundings, I am encouraged and excited to work with him next year toward the vision that students, faculty, staff, community, and board members have crafted for PUC,” remarked junior business and communication major Kenzie Hardy, incoming president of the Student Association. “As an alum, PUC is very near and dear to my heart. As an employee, every day I look forward to working with our student leaders, student body, and Dr. Cushman. Knowing his goal is to continue helping PUC be a vibrant and collaborative learning community assures me PUC is in great hands,” shared J.R. Rogers, associate vice president of student life. A reception at the Paulin Hall fountain immediately followed the inauguration, where the campus community gathered together to celebrate the future of Pacific Union College and Cushman’s leadership. Founded in 1882, Pacific Union College is a fully accredited liberal arts college serving more than 1,200 students. The college’s overall program offers a full lineup of bachelor’s degrees as well as several associate degrees, one master’s degree, and pre-professional and degree completion programs. A destination campus in California, PUC is Napa Valley’s only four-year college and is affiliated with the Adventist Church. This press release was written by Pacific Union College. Image courtesy of PUC.